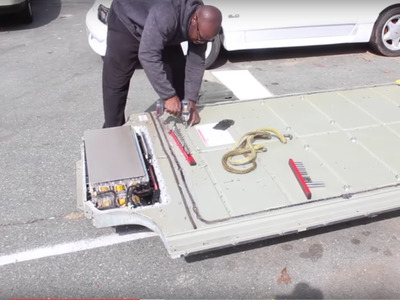 YouTubeRich Benoit, taking apart a Tesla battery. Tesla has mandated that it alone can fix its cars, but one Massachusetts man doesn’t care about that. Benoit publishes his work on YouTube, and his show is called ‘Rich Rebuilds.” Thanks to his work he’s become something of a cult hero in the world of cars, and even inside Tesla. Benoit thinks he’s found a loophole that will let him continue to do his work without has tle – a Massachusettes law that gives people the “right to repair” their own property, and forces manufacturers to give them access to tools and diagnostic software to do so. But Benoit has asked Tesla for help, and the company hasn declined. And the company has found ways to skirt around the law. It says the customers should have access to the same tools their dealers have, but Tesla is a direct to consumer company. It has no dealerships. “That loophole is interesting because in Massachusetts Tesla actually did publish some repair manuals, but they’re not very well written and they take you to tell you how to take things apart, which was great,” Benoit said. “But the major thing that we’re looking for is the diagnostic software to fix it. Benoit says he loves and admires Tesla, and for right now the two sides are at a stalemate. Benoit is on his own, and inside Tesla there is a sense that what helps more than it helps – for now. If you are a Tesla employee or customer who has a story to share about a car or experience with the company, give me a shout at [email protected].